OS-MO-FLO for dogs and cats help restore your pets to normal bowel movement, safely, naturally, effectively! Who Are The People At Horse Sense Solutions? Horse owners and pet owners! Every staff member at Horse Sense Solutions has been involved with dogs, cats and horses on a personal level for years, they just go together. The staff knows first-hand of that the DIGESTIVE Issues present a serious threat to the health of horses, dogs and cats — and they have formed a revolutionary product line which assists with the normal flow of digestion. Often, horses may have digestion difficulties by simple acts of severe weather change, change in their routine or an abrupt change in feed source--many times dogs and cats will experience the same. Our “Horse Sense” Is… Well… Common Sense— Even For Dogs and Cats Too! If you see signs of digestive flow not appropriately taking place, it may be as simple as your dog refusing to eat. Horse Sense Solutions has different products for different needs. It's what you do first. Our product is unique to any product on the market, by the “response" in maintaining the normal flow. Keep products readily available on your shelf. Our products DO NOT contain probiotics. We also make a special formulation for horses— along with our Dog and Cat formula. Is Your Dog Experiencing Hard or Too Loose Stools? So What Can You Do To Help? We’ve all seen it… dogs and cats straining to go— or, miserable with watery stools. It is a terrible sight and one that leaves owners worried and your pets feeling miserable. If you see signs of digestive flow becoming slow and not appropriately taking place - it may be as simple as your dog refusing feed. This is a common sense approach to keeping digestive tract moving appropriately. This unique formula promotes normal digestive “Flow" to assist with Normal Bowel Movements. This promotes the normal flow of digestion and elimination of retained stool. May be given to dogs and cats of any age, size or weight— even safe for pregnancy! PROMOTES NORMAL BOWEL MOVEMENTS. OS-MO-FLO for Dog and Cats is packaged in ready-to-use, liquid form with oral dose syringes; multi dose bottle. What Temperature Do I Need To Store OS-MO-FLO? Best stored at Room Temperature 70 degrees. Although, high temperatures do not affect integrity of products. If accidentally freezes just thaw out and use will not affect the products. Temperature does not affect product. May keep in feed room or in trailer. How Should OS-MO-FLO Be Administered? All products designed for easy application. Just lift your horse's or pet's head upward; with the included open end syringe (like a wormer) squeeze in the mouth and watch them swallow. Has a sweet taste! That's all there is to it! All Feeding Directions are located on labels. Oral dosing syringe is included in canister with all of our Liquid Formulas. What Do Dog and Cat Owners Have To Say? My little Chihuahua had watery stools with a foul odor that just wasn't normal. 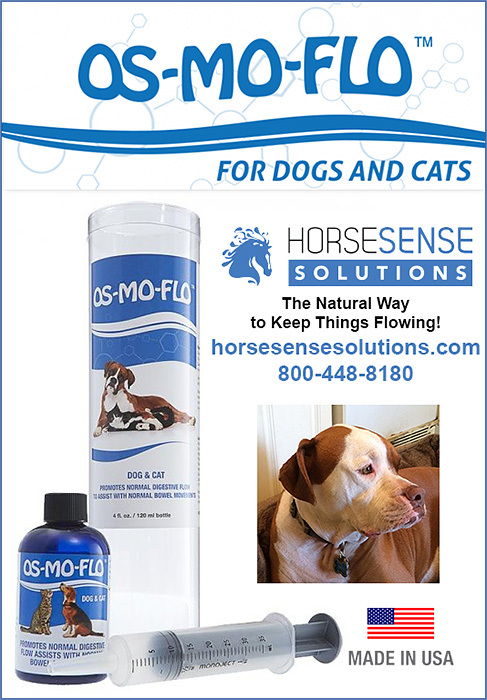 Reba at Horse Sense Solutions sent me a bottle of OS-MO-FLO for dogs and cats. After just ONE dose- my little 2 year old Chihuahua had normal stools with no unusual odor. I was thrilled. Super easy to use-- even for fussy Chihuahuas! He has been back to normal now for 2 months. I am thrilled! OS-MO-FLO has been called a “miracle” by customers who had constipated and watery stool pets- and then have seen normal digestive flow restored. Make sure to have it in your home available for the unexpected. At only $34.95 for multi doses. [Reba] It is the most affordable, and often the most effective thing that can be done for dogs and cats suffering with proper digestive flow. You’ll never regret having it. The 5 year shelf life makes it a truly worthwhile investment— Call and order today! Be sure to take with you on trips so that you can be prepared!